When it comes to keeping unwanted personnel out of your property, whether that be an estate or an alcove, you can't be expected to hang around holding the big guns all day long. That's when you need an automatic-targeting turret, and Rick Prescott's Infrared Seeking Sentinel is a good, non-lethal choice. 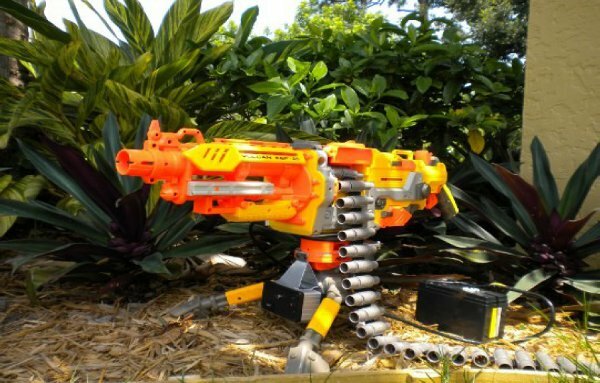 Built on a Nerf Vulcan EBF-25, he added an infrared tracker, motor, and battery pack to make the thing autonomous, capable of firing in semi- or full-auto modes. He's posted full instructions on how to make your own, and his effort won him the Make Gadget Freak Design Contest. It also won him something else: our admiration. Full explanation and demonstration after the break.